Lance Cpl. 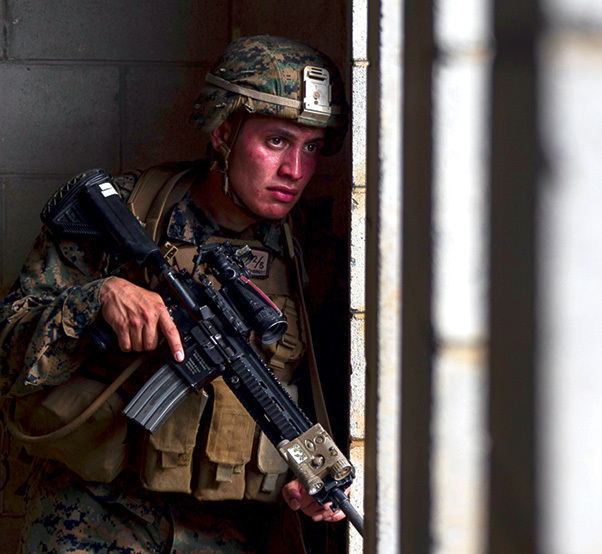 Ezequiel Hernandez, a rifleman with Echo Company, Battalion Landing Team, 2nd Battalion, 5th Marines, holds security inside a secured building during a mechanized assault on Combat Town as part of the 31st Marine Expeditionary Unit’s MEU Exercise, Central Training Area, Okinawa, Japan, June 28, 2018. Hernandez, a native of Las Vegas, graduated from Legacy High School in May 2016 before enlisting in November of the same year. Marines and Sailors with Echo Company performed the final training event of MEUEX, an assault launched from Camp Schwab and targeting Combat Town, part of Okinawa’s Central Training Area. Marines with Echo Company, the mechanized assault element with BLT 2/5, partner with AAV crews to perform raids and assaults launched from the sea. MEUEX is the first in a series of three pre-deployment training events that prepare the 31st MEU to deploy at a moment’s notice. The 31st MEU, the Marine Corps’ only continuously forward-deployed MEU, provides a flexible force ready to perform a wide-range of military operations.